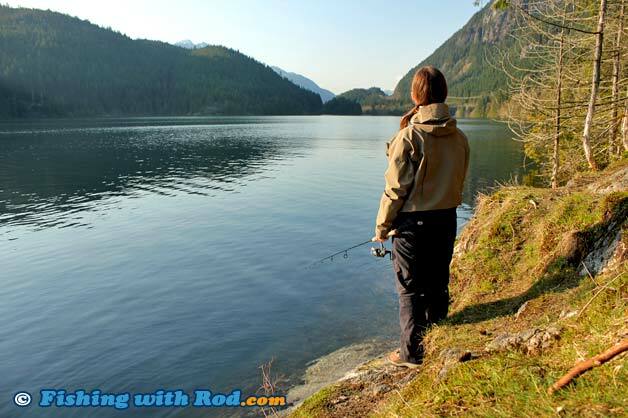 Although it is just within a short drive from Metro Vancouver, fishing experience at Buntzen Lake can be described as being intimate with wilderness. It is a popular recreational site for multiple user groups, including hikers, mountain bikers, equestrians and of course anglers. On a warm summer day, families can be found enjoying a picnic gathering by the lake. This is a spot for anglers who cannot get away for the weekend but still want a chance to connect with multiple trout. Buntzen Lake is in Buntzen Lake Reservoir Park, which is just north of the City of Port Moody. To get there from Vancouver, head to Barnet Highway in Port Moody. From Barnet Highway, turn left onto Heritage Mountain Boulevard. Continue on Heritage Mountain Boulevard and follow the park signs to Sunnyside Road, which eventually leads you into the park. There are several visitor parking lots at the southern end of Buntzen Lake. A boat launch can be found at the BC Hydro recreational site, which is not too far from the parking lots. There is a access road from the lot to the launch, but it is narrow and can get rather busy during the day so it is best to plan ahead and arrive early. A marked hiking trail loops around the entire lake. Like many other Lower Mainland lakes, Buntzen Lake is regularly stocked with rainbow trout by the Fraser Valley Trout Hatchery between March and June, September and November. Stocked rainbow trout are typically between 12 and 14 inches, or 250grams. It is also inhabited by a native population of cutthroat trout and other coarse fish such as northern pikeminnow. Small kokanee can also be found during the summer months. Trout fishing is best during spring and fall, while anglers often find coarse fish plentiful in the summer with a possibility of hooking some trout in deeper water. Power boats are prohibited but electric motors can be used. Fishing from a boat is best at Buntzen Lake, but there are also many shore spots such as floating docks and steep rocky drop-offs, which can be accessed by a network of trails around the entire lake. When fishing on the floating docks, you can spincast with artificial lures or bait. Because the lake is quite deep, allow the lures to sink for ten or twenty seconds before retrieving. If you are fishing with a small spoon, the occasional pause during the retrieve can sometimes trigger a strike. Bait fishing can be done either with or without a float, depending on the time of the year. After a warm day, trout have a tendency to be near the surface in the evening. It is best to use a float during this time. On really warm or cold days, resting the bait on the bottom may trigger more bites. Dew worm, deli shrimp, roe, single egg and artificial scented bait will work for both trout and coarse fish. Flyfishing is not suitable on the floating docks, because they are often heavily used by other anglers. Many often troll microleeches on a boat, but flycasting and stripping can be just as effective if you are able to locate a school of feeding fish. Buntzen Lake is located in Region 2 in the British Columbia freshwater fishing regulations. Be aware of the park's opening and closing times.